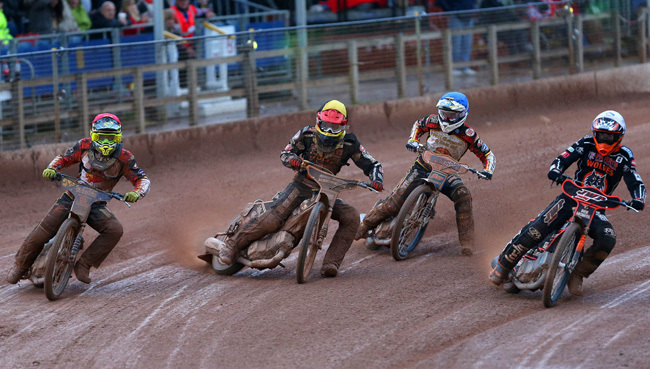 WOLVERHAMPTON roared back to the top of the Elite League table with a 51-39 away win at Leicester. The Parrys International Wolves struck three 5-1s in the final three races as a stunning late surge saw them claim all four points. It was another battling performance from the Monmore men in tricky conditions to earn them their third away victory of the season and complete a quick-fire double over the struggling Lions. Skipper Freddie Lindgren led by example to continue his fine form, being involved in maximums in heats 13 and 15 to ensure a tense tie swung in their favour. Lindgren was in jubilant mood after they recorded another excellent victory to leapfrog Swindon and climb back to the top of the standings. “Tonight was really tricky with the rain we had, and it was a tight match for a long time with only a couple of points in it,” Lindgren said. The Swedish star was in impressive form throughout, notching double figures from the No.1 spot, whilst Aussice ace Sam Masters returned to haunt his former club with a stunning 14 point haul. He dropped just one point from his five rides in the engine room of the side, wrapping up a superb evening by taking the chequered flag in the final two races. Kyle Howarth and Joonas Kylmakorpi both ran no last places and claimed a paid win apiece with solid performances, whilst Mikkel Bech dusted himself down from an awkward fall in heat two to notch a vital paid eight. Jacob Thorssell also recovered from a nasty crash in his third outing to strike a 5-1 alongside Masters in the penultimate race to guarantee victory. Local lad Ashley Morris was also in the mix throughout as he earned two points against a strong Lions’ reserve pairing. Peter Adams’ high-flying side will be back in action next Monday, May 30 (7.30) as they host King’s Lynn to kick-off a hectic week with four meetings in seven days. LEICESTER 39: Paul Starke 12, Nicolai Klindt 8+1, Aaron Summers 6, Patrick Hougaard 6, Szymon Wozniak 6, Josh Auty 1, Davey Watt 0. WOLVERHAMPTON 51: Sam Masters 14, Fredrik Lindgren 10+3, Kyle Howarth 7+2, Joonas Kylmakorpi 7+2, Mikkel Bech 6+2, Jacob Thorssell 5+1, Ashley Morris 2.